In 1960 a director of local basic school gave sword to the authotities recently found by a schooboy. Shortly after archeology excavations started. Archeologic teams have found rather unique grave of local warlord of Przeworsk culture from third century ad. In second century AD wars held between romans and germans on the north borders of Roman Empire were brutal and expensive. One of the remaining relic from that fights was a grave of a young, wealthy warrior excavated in Podlodowa village, south ease of Poland. Not only sword was found - but also umbo, remains of spear, spurs. What is surprising, the sword found few hundred kilometers from furthest north border of SPQR empire was that he was incrusted with copper depictions of roman gods: Mars (god of war) and Victoria. The sword was found bended, so the burrial of warrior was glamorous. As the sword shows signs of high quality, high craftsmanship and symbolism it is rather likely that it was bought from roman traders. It was probably instead captured or looted during fight. Grave finidings dated at 3rd century AD must have belonged to a horse warrior (as the items found suggest). He must have been a wealthy man, as only the wealthiests were able to obtain horse equipment and - the most expensive - high quality sword which was not only a life saving tool, but also a symbol of wealth and power. It looks more suited to the battlefield of Agincourt to protect against the volleys of French arrows. But this medieval-style chain mail mask is actually a rare survivor of the Western Front of the First World War. 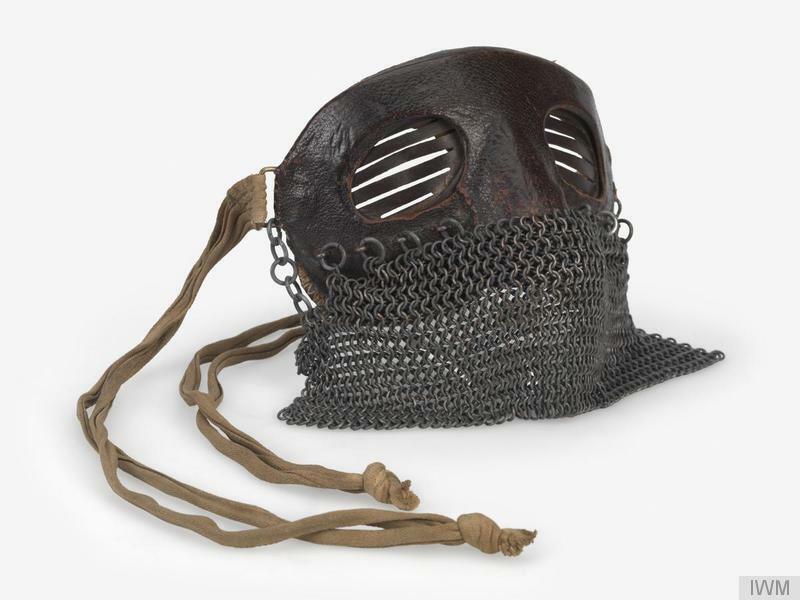 It was worn by the pioneering British tank drivers at the Battle of Cambrai in 1917. The vehicles, which were still in their infancy as machines of war, were piloted from fume-filled cabins. 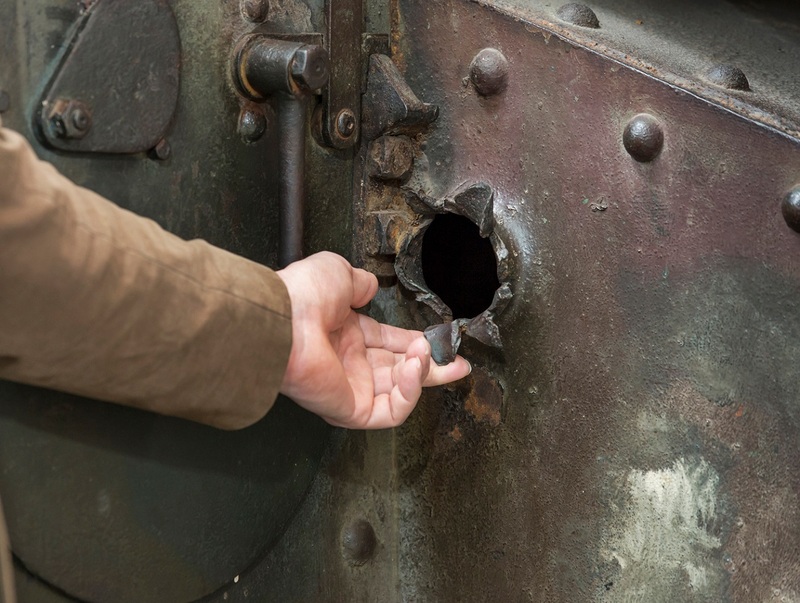 And the drivers were often at risk of taking red hot shards of metal in the face as enemy machine gun fire and shells smashed into the exterior. 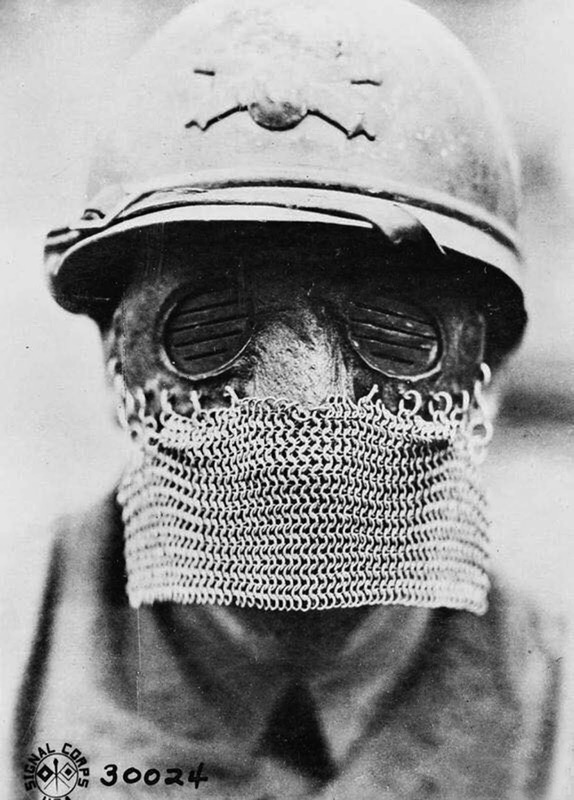 And so these masks were designed to protect the drivers faces and eyes in the heat of battle. However, very few survived the war. Tanks were developed during the First World War in bid to break the stalemate of trench warfare. A prototype vehicle, nicknamed Little Willie, was constructed by the British company William Foster & Co, during August and September, 1915. This provided the basis for the Mark I tank that was demonstrated to the Army on February 2, 1916. 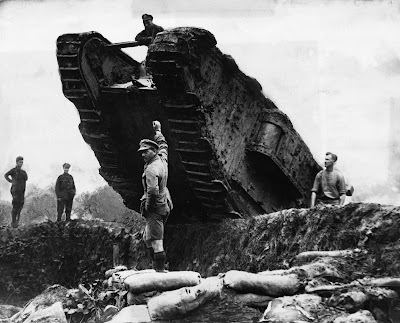 Although initially called 'land ships', the vehicles were nicknamed 'tanks' to preserve secrecy after it became known that the factory workers referred to the first prototype as 'the tank' because of its resemblance to a steel water tank. The heavily shelled terrain around the trenches and in no-man's land was impassable to conventional vehicles. The Mark I's rhomboid shape, caterpillar tracks, and 26 feet length meant that it could navigate obstacles, especially wide trenches, that wheeled vehicles could not. However, the first tanks were highly unreliable, with a number of mechanical problems that caused considerable attrition rates during combat deployment and transit. Those deployed by the British at Cambrai were Mark IV tanks and despite initial success, German artillery and infantry defences exposed the frailties of their armour and the vehicles became mostly ineffective after the first day. Tank design gradually improved in the inter-war period and during the Second World War, where they had once been used to support infantry, the concept of Blitzkrieg made tanks a formidable branch of the army in their own right. The Battle of Cambrai proved to be a significant event in the First World War. The town itself was important because it contained a strategic railhead and was near the Hindenburg Line - the Germans' vast network of defences in northeastern France. The attack started at 6.20am on November 20, 1917 with an intense artillery attack directly on the Hindenburg Line, which surprised the Germans. Then 350 British tanks began their advance across the ground supported by infantry - both were assisted by an artillery rolling barrage that gave them cover from a German counter-attack. The bulk of the initial attack went well. The 62nd Division (West Riding) covered more than five miles in this attack from their starting point. Compared to the gains made at battles such as the Somme and Verdun, such a distance was astonishing. The loaf is round and plump, like a cake, and divided into eight wedges. But it is unmistakably bread , and rather appetising, too. 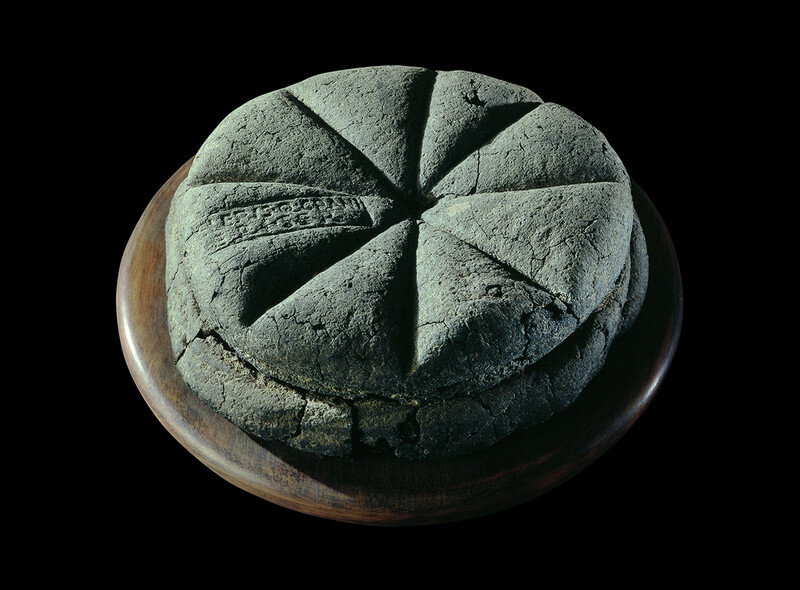 Which is extraordinary, considering that it was put in the oven to bake one morning in Herculaneum nearly 2,000 years ago. The baker left his stamp. His name was “Celer, slave of Quintus Granius Verus”. For all the distance of years, the food of Pompeii seems sunny and alive. We know that these ancients ate broad beans, olives, peaches, dates, almonds, sour cherries, crab apples, pears and walnuts. Consider fish, instead. A mosaic found in Pompeii depicts a huge range of octopus, squid, lobster, prawn, eel, bass, red mullet, dogfish, ray, and some kind of snail-like mollusc: quite a plateau de fruits de mer. Pompeians were also excessively fond of a salty fish sauce called garum, similar to Thai fish sauce. Beginning in the year 168 B.C., the Romans legislated and formed the first baker’s guild, known as the Collegium Pistorum. The word pistorum comes from the phrase to grind so the guild members not only baked but also milled grains. Soon after the formation of the guild, the Roman government took control; bread became a regulated public commodity with price increases requiring high levels of legislative approval. There are many documented pleas sent to various Emperors asking for an increase in the subsidized bread prices. 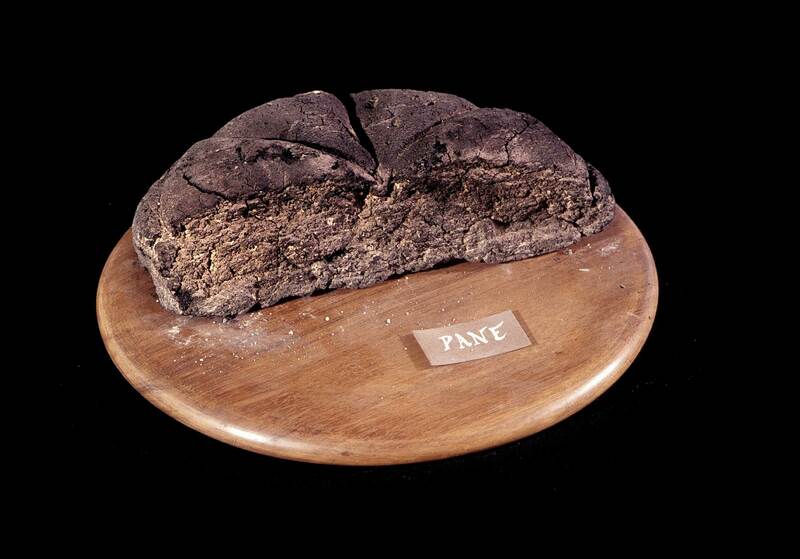 Some types of bread were decorated with anise, poppy seeds, sesame and other trees established on the crust with egg white. It seems that only in the late-Republican began to use the yeast, obtained by mixing millet or bran flour to sour. The ovens were made of bricks (opus latericiumcium), while the floor of the bakery was made of slabs of basalt lava, the same material used to pave roads, which facilitate the revolution of animals or slaves who pushed the millstones tied to wooden beams.